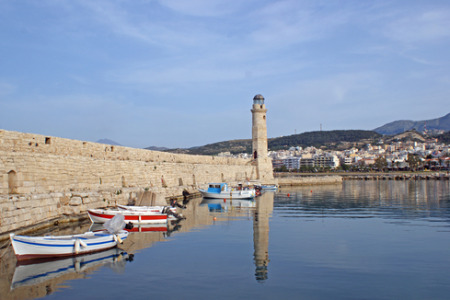 Rethymnon holidays take you to an area of great scenic beauty on the northern coast of Crete. With an historic centre, a beach lapped by crystal waters and a variety of leisure pursuits, holidays in Rethymnon have wide appeal. The sand and shingle beach slopes gently into the sea giving safe conditions for children and less confident swimmers. Holidays to Rethymnon can be taken from April until October with temperatures rising to thirty at the height of the season. With good accommodation and excellent restaurants, our cheap Rethymnon holidays are considered great value, particularly since our commitment to quality and service never wavers. Explore the maze of narrow cobbled streets and alleyways in the medieval heart of the old town and delight in the elegant Venetian architecture, and the old churches. Don't forget to visit the famous Rimondi fountain which is almost four hundred years old. Our low cost Rethymnon holidays can be as relaxing or as active as you wish as there is plenty to see and do in this charming town and in the surrounding area. If you are looking for a guarantee of summer sun in a warm and friendly resort, our last minute Rethymnon holidays may be just the ticket. For further details and to view our best Rethymnon holiday deals, please use the search facility.